Here's a few other cards I was working on with the Fifth Avenue Floral using the Paper Tole Technique. This image is perfect for that technique! 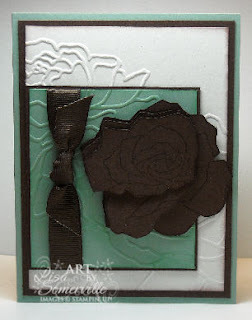 For this card, I created the background using the Triple Dimension Technique using Rose Red, Chocolate Chip and Sage Shadow Inks - makes for an interesting background. 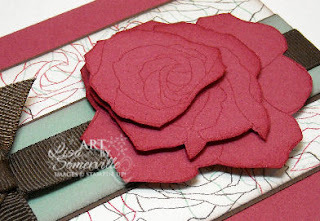 Then I stamped and and assembled my Rose using Rose Red ink and card stock - sponging the edges first to give it more dimension. 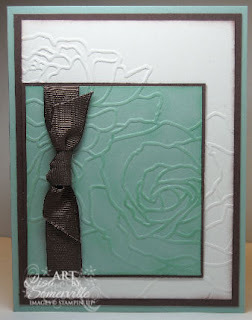 This card uses the new Manhattan Flower Die (embossing folder) which matches the Fifth Avenue Floral Set. The card looked way to plain to me, and adding a sentiment wasn't really doing anything, so I decided to add a Paper Tole Flower. See card below. oooooh...Lisa these are SO pretty! You're really rocking this stamp set! 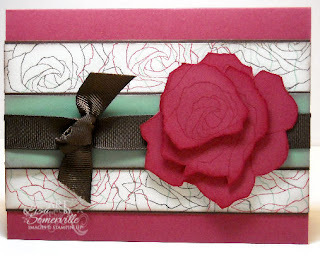 Oh Lisa - I LOVE the paper tole rose!! Just gorgeous!